The elegance of Bristol’s Art Glass enlightens Bristol’s Ultimate Replacement Windows with additional style, beauty and charm. State-of-the-art manufacturing makes this distinctive look available at very affordable costs. This unique feature adds an account of a fine architecture! It is designed to complement your home’s beauty with a definite distinction. 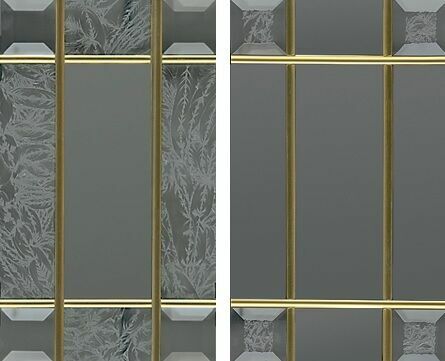 Two different patterns include the choice of center sides and top etched with frosted patterns and corners beveled, or corners with beveling and frosted pattern. Care Free Beauty – No additional cleaning ever required because materials are between two panes of glass.